Beth's new book just hit the shelves! 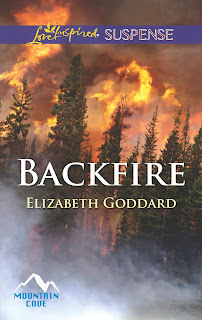 To celebrate the release of Backfire (Mountain Cove) we're giving away a copy here on Suspense Sisters! We'll also be hearing more about the book all this week. Tracy Murray had thought she'd be safe disappearing in the wilds of Alaska after her testimony put away a gang leader. But the gang symbol tattooed on an attacker's arm means the clock has run out. She's been found—and she knows the killers won't let her escape alive again. She can't fight an entire gang alone—she needs help. But when she finds herself relying on widowed firefighter David Warren, a new struggle emerges. Fleeing Alaska and cutting all ties could be the only way to survive…but it would mean leaving her heart behind. AN EXCERPT FROM "BLESSINGS IN DISGUISE"